when calculating the Force of 2, why isn't the force from 2 to 1 negative? Hi moopen, thanks for the question. 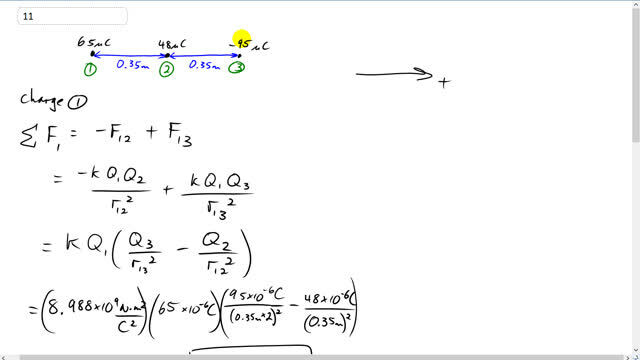 When calculating the net force on charge 2 we're interested only in forces exerted on charge 2. The charge 1 is exerting a force to the right on charge 2, so that force is taken as positive. It's true that charge 2 exerts a force to the left on charge 1 (this is the Newton's 3rd Law counterpart to the force exerted on charge 2 by charge 1), but this force isn't relevant since it isn't exerted on charge 2. Vancouver, BC, Canada. All prices are in USD.